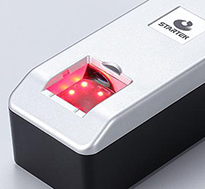 FC320U is a single fingerprint capture device designed to meet the stringent USA government’s FIPS 201/PIV requirement, an image quality level demanded by FBI’s Image Quality Specifications (IQS) for fingerprint readers. Startek’s NIST MINEX-approved template extraction and matching algorithms (optional) can serve together. FBI’s PIV testing ensures excellent image quality of the capturing hardware; NIST’s MINEX testing not only ensures the accuracy of matching algorithms and characteristics extraction but also interoperability of extracted fingerprint templates. By meeting and exceeding the criteria of both PIV and MINEX testing, FC320U proves to be perfect candidates for customers requiring fingerprint authentication applications to be compliant with FIPS 201/PIV, a sure trend of industry adoption, behind which objective, third-party certification against rigorous standards backs.